Abu Kamel of the Al-Kurd family, evicted by Israel from their home in Occupied East Jerusalem on the 9th November, has died after suffering from a severe heart-attack. This comes two weeks after he was taken immediately to hospital following the night-time invasion and forcible eviction from his home of 52 years by Israeli forces. The funeral will be held at 11am, 23rd November in Sheikh Jarrah, Occupied East Jerusalem. Suffering from dangerously high blood pressure, in the aftermath of his family’s eviction from the emblematic house in Sheikh Jarrah and consequently being left homeless, 61 year-old Abu Kamel suffered from a deterioration with his long-term health problems and was re-admitted to hospital at around 10pm, Saturday 22nd November. It was soon announced that he had suffered from a heart-attack and died. 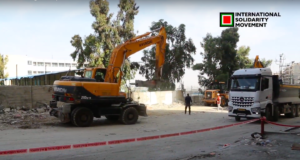 Fawzia al-Kurd has now lost her husband and her family home within two weeks due to the Israeli state’s campaign expand Jewish settlements in the Sheikh Jarrah neighbourhood. Despite high-profile formal complaints from the US State department, numerous foreign consulates, and European politicians, who openly questioned the legality of the settlers claims, Israel violently pursued its plans to evict the refugees from 1948. It should also be noted that after having been made refugees from West Jerusalem in 1948, the al-Kurd family were subsequently made refugees a second and third time as Israel evicted them from their home on the 9th November before proceeding to destroy the tent that was established on the 19th November. The health of Abu Kamel was central to the Israeli campaign to occupy the al-Kurd house. 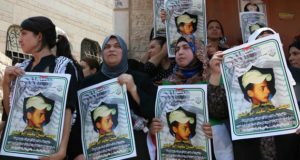 In 2001, as the family was abroad in Jordan visiting Abu Kamel while he was receiving treatment, settlers broke into part of the family home that they have continued to occupy ever since. In 2006, the court ruled the settlers claim void, recognizing it was based on fraudulent documents. 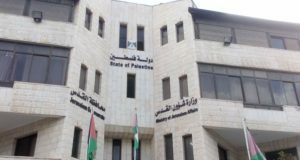 Subsequently, the Al-Kurd family lawyer petitioned the Israeli Land Registrar to revoke the settlers registration of the land and state the correct owner of the land. Although it did revoke the settlers claim, the Israeli land Registrar refused to indicate the rightful owner of the land. In 2001 settlers began occupying an extension of the al-Kurd home. Despite the fact that their claim to the land was revoked, settlers were given the keys of the al-Kurds family home extension by the local Israeli municipality. This was possible after the municipality had confiscated the keys of the extension that the al-Kurd family built on their property to house the natural expansion of the family. When this extension was declared illegal by Israeli authorities, the Israeli municipality handed the keys over to Israeli settlers. The al-Kurd family went to court and an eviction order was issued against the settlers. When the al-Kurd family were evicted on the 9th November 2008, the settlers were allowed to remain in the property, despite their own eviction order. In July 2008 the Israeli Supreme Court ordered the eviction of the al-Kurd family, for their refusal to pay rent to the settlers for use of the land. Although the settlers claim to the land had been revoked two years earlier, the court instead based their decision on an agreement made between a previous lawyer and the settlers. It should be noted that the al-Kurd family -and the Sheikh Jarrah neighborhood as a whole- rejected this agreement and fired their legal representative at the time.